Fitness was never in my bucket list until a year back when I joined Dream Runners(DR) and rediscovered a new breed of success. “What’s the point winning a world where you are losing within ”. Running has given me a new perspective to life where I’ve won many battles internally. A day of intense training with “Nature as the best gym” along the famed Marina beach with our trainer and run buddies gives us a fresh start to conquer the day. So, whether it boils down to a healthy lifestyle away from all sedentary health hazards or a bunch of like-minded fitness freaks whose peer influences matter most than peer comparisons have all been an outcome of running. The best moment was when I summitted a mesmerizing peak at 13000 ft in the mighty Himalayas. 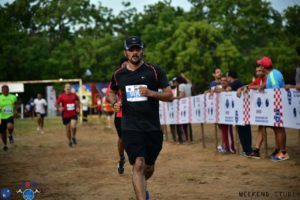 Standing high in the lap of mother nature, I realized that it all started with the disciplined fitness regime with dream runners where endurance and stamina build up was an everyday affair. For me, the journey has just begun and I have discovered that there is something which is “more than just a run”-a feeling where you are a winner. A winner who has won an everyday battle of rising up when the world is still asleep, a winner where one’s fears/emotions are conquered and brings out abilities which I never realized existed and most of all a winner who enjoys life’s journey as we traverse along not expecting what the outcome shall be.